Need help trying to date and identify family photos? 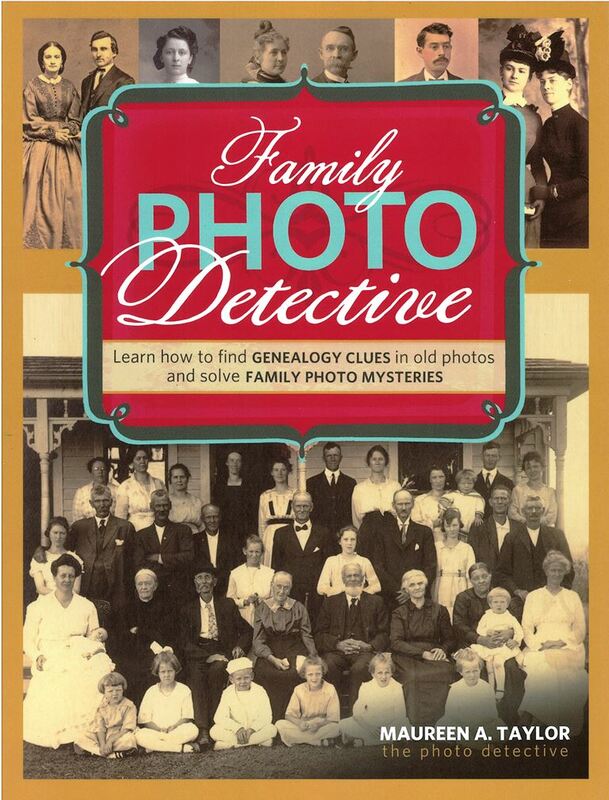 Maureen A. Taylor's "Family Photo Detective" book can help. Includes an overview of different types of photographs and when they were used as well as charts and information about how to date photos based on the style and material used for a photo print and mat. Also contains tips for dating photos based on the fashion and hairstyles seen in them. With the case studies, helpful tips, and worksheets for identifying photos, this book is sure to be a useful resource for any family historian. 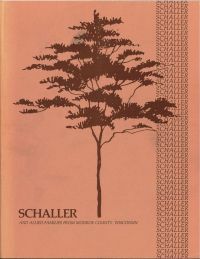 Published in 2013 by Family Tree Books. Soft cover, 172 pages. Locating original landowners in maps has never been an easy task-until now. This book contains newly created maps of original landowners (patent maps) in what is now Monroe County, Wisconsin, gleaned from the indexes of the U.S. Bureau of Land Management. But it offers much more than that. 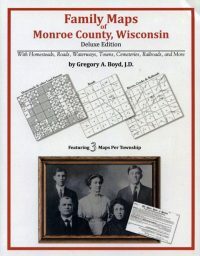 For each township in the county, there are two additional maps accompanying the patent map: a road map and a map showing waterways, railroads, and both modern and many historical city-centers and cemeteries. By Gregory A. Boyd, J.D. 352 pages with 83 total maps. 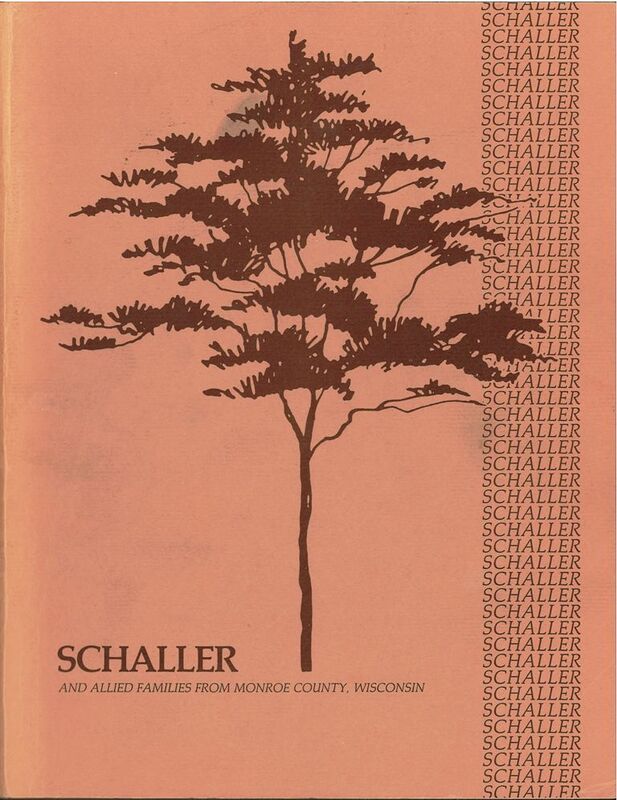 Extensive genealogy of the Schaller family of the Monroe County area, including many related families. Created by Alice Schaller in 1983. 383 pages. 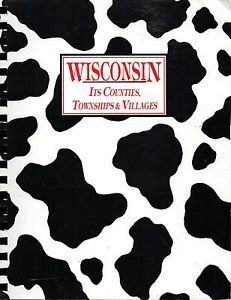 1994 edition of Wisconsin Its Counties, Townships & Villages compiled by Wendy (Zastrow) Uncapher and Linda (Zastrow) Herrick. From the introduction: "The purpose for this book is to show township relationships and list as many towns (incorporated or unincorporated), railroad depots and post office names as could be identified." As town lines and names change, this book can be a helpful resource to determine where a place was once located. Includes township maps for each county index. Spiral bound, 70 pages, good condition. 1985 Pictorial Atlas of Monroe County, WI: Volumes I & II. Two huge volumes, a combined two inches thick, of county and family histories. Wire bound, leather like covers measuring 10” x 13”. 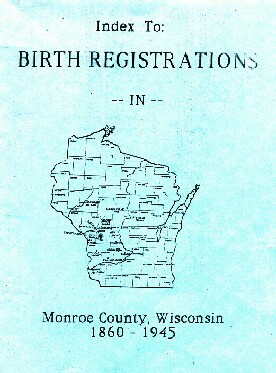 Compiled and published by the Title Atlas Co., Inc. Volume I contains: • Maps of the United States, Wisconsin, Monroe County • Plat maps of Monroe County townships showing land ownership • Patron Index allowing for easy name look ups • Patron Directory providing name, spouse name, children names, occupation, address, length of time in county, etc. Volume II contains: • Photographs of county libraries, churches, schools • Historic photographs of patron ancestors • Studio photographs of patrons and family • Submitted family photographs • Historical sketches of Monroe County townships, communities, villages, churches, places, events, businesses • Family histories • 1915 Plat Book of Monroe County complete reprint. Spiral bound; good condition. [Note: This is an extra copy donated as a fundraiser]. 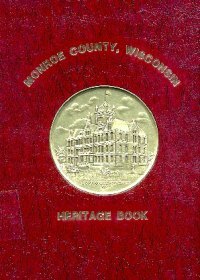 Monroe County (Wisconsin) Heritage Book. 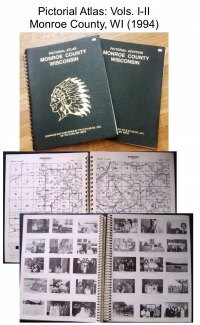 Soft bound, 9x12, 514 pages, 1,450 submitted family histories, most with photographs, includes surname index, 12 pages of business histories. 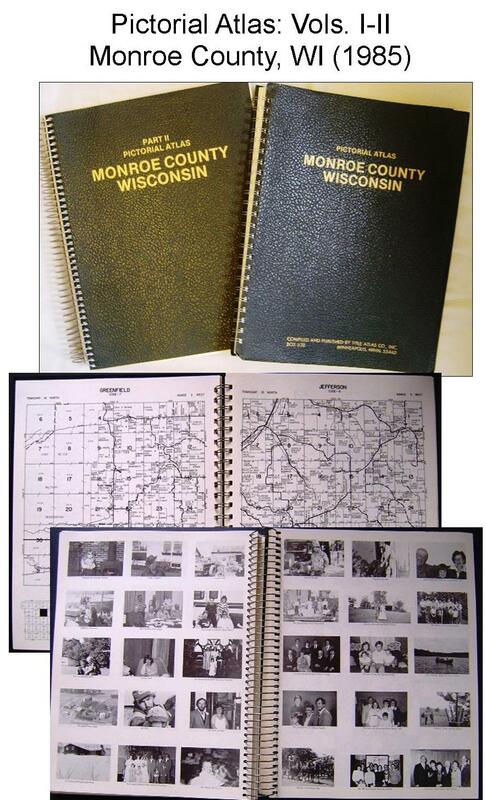 1994 Pictorial Atlas of Monroe County, WI: Volumes I & II. Two huge volumes, a combined inch and a half thick, of county and family histories. Wire bound, leather like covers measuring 10” x 13”. 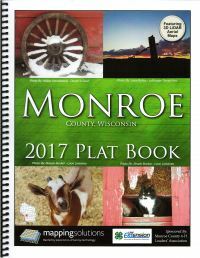 Compiled and published by the Title Atlas Co., Inc. Volume I contains: •	Maps of the United States, Wisconsin, Monroe County •	Plat maps of Monroe County townships showing land ownership •	Patron Index allowing for easy name look ups •	Patron and Township Directories providing name, spouse name, children names, occupation, address, length of time in county, etc. •	Brief histories of select government buildings, churches, libraries, businesses, and farms •	Reprint of 1897 Monroe County Plat Maps Volume II contains: •	Photographs of Monroe County public buildings •	Historic photographs of patron ancestors •	Studio photographs of patrons and family •	Submitted family photographs Excellent condition. [Note: This item was donated to the LHR to sell as a fundraiser since it duplicates superior examples already in the LHR collection. Money raised from the sale of this item directly supports the Local History Room research library]. 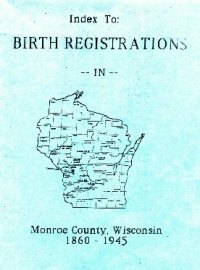 Index to Birth Registrations, Monroe County, Wisconsin, 1850-1944. 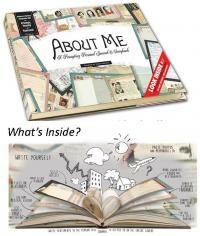 Soft cover, 638 pages, 8½ x 11, (shipped without binding, will hole punch if requested). 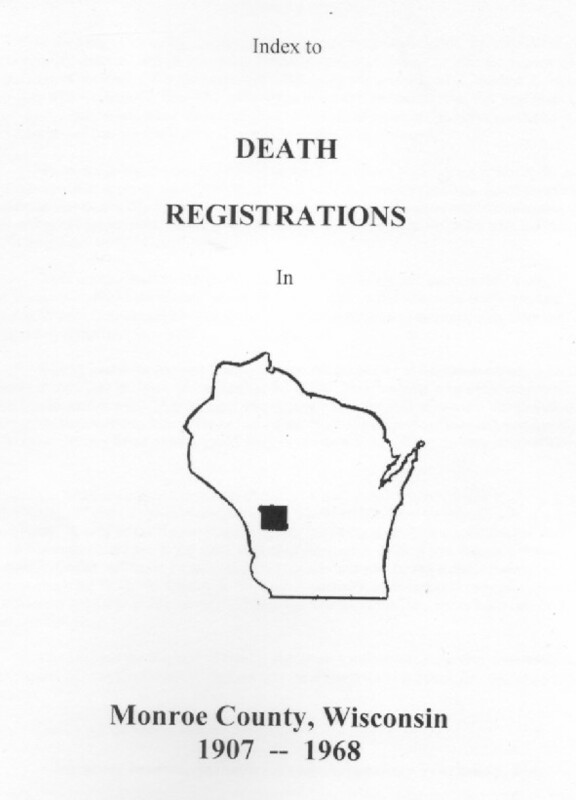 Alphabetical with date of birth, volume and page, transcribed from original records at the Register of Deeds, Sparta, Wisconsin. 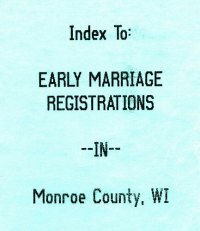 Index to Marriage Registrations in Monroe County, Wisconsin, 1855-1907. Soft cover, 8 ½ x 11, 289 pages, names, date of marriage, volume and page, transcribed from original records at the Register of Deeds, Sparta, Wisconsin. 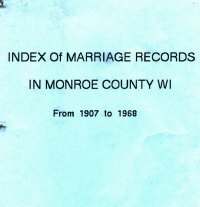 Index to Marriage Records, Monroe County, Wisconsin, 1907-1968. 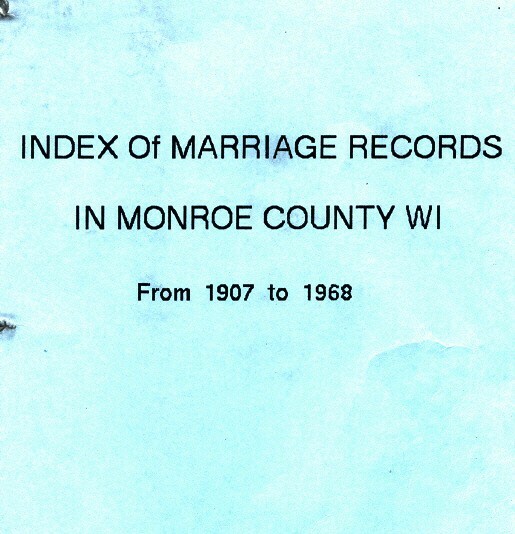 487 pages, alphabetical index of marriage records of Monroe County, Wisconsin, with a few earlier marriages noted. 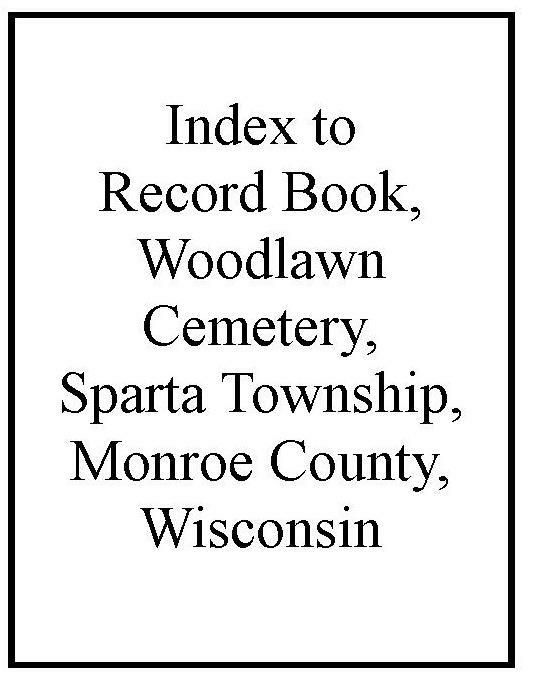 Includes name, spouse, date, volume and page, transcribed from original records at the Monroe County Register of Deeds, Sparta, Wisconsin. 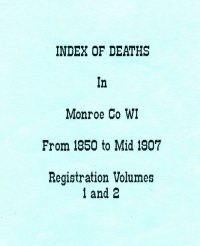 Index to Death Records, Monroe County, Wisconsin, 1856-mid 1907. 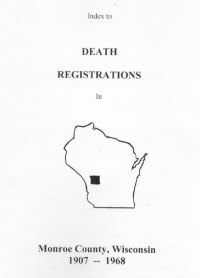 Soft cover, 8½ x 11, 43 pages, includes surname, given name, date of death, volume and page, transcribed from original records at the Register of Deeds, Sparta, Wisconsin. 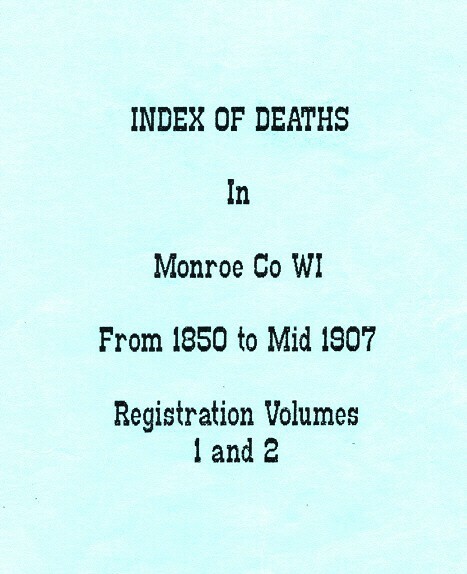 Index to Death Registrations in Monroe County, Wisconsin, 1907-1968. 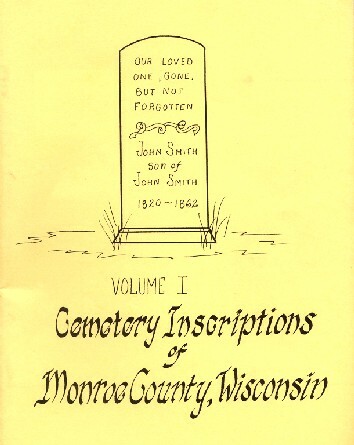 Soft Cover, 8½ x 11, 400 pages, includes surname, given name, date of death, volume and page, transcribed from original records at the Register of Deeds, Sparta, Wisconsin. 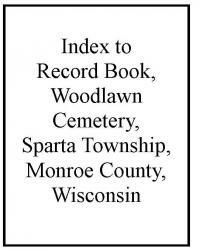 Index to Record Book, Woodlawn Cemetery, Sparta Township, Monroe County, Wisconsin. 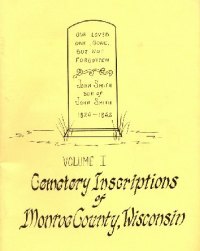 Soft Cover, 8½ x 11, 57 pages, includes maps of the four cemetery sections, each with its own alphabetical index with name, lot & block number, and page number from Record Book located in the Monroe County Local History Room, Sparta, Wisconsin. Cemetery Inscriptions, Woodlawn Cemetery, Sparta Township, Monroe County, Wisconsin. Soft Cover, 8½ x 11, 108 pages with 1,406 family entries, first and last names, date of death, indexed. 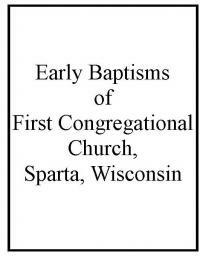 Early Baptisms of First Congregational Church, Sparta, Wisconsin. 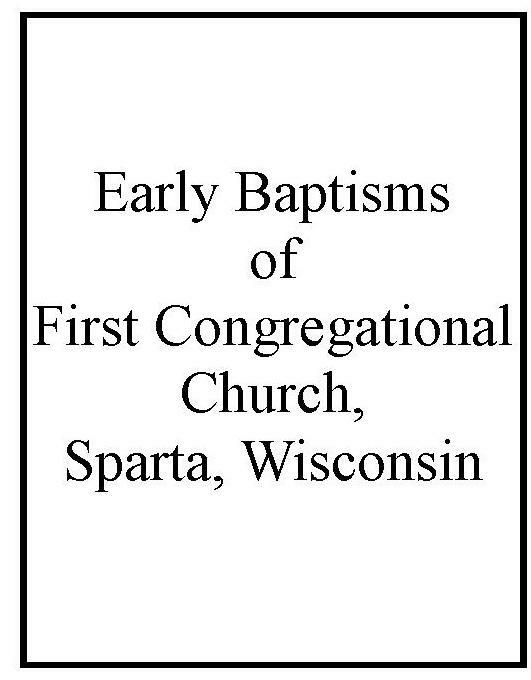 Soft Cover, 8½ x 11, 10 pages, includes name of child, date of baptism, parents, birth place, date of birth (if known), plus a list of Pastors. Surname index and tombstone inscriptions for those buried in Jackson County cemeteries. Set of 6 including: Volume I Riverside Cemetery; Volume II Cleveland, Curran, Garden Valley, Garfield, and Northfield Cemeteries; Volume III Townships of Adams, Alma, and Komensky Cemeteries; Volume IV Irving, Melrose, and North Bend Cemeteries; Volume V Townships of Albion, Bear Bluff, Brockway, City Point, Knapp, Manchester, and Millston Cemeteries; and Volume VI Townships of Franklin, Hixton, and Springfield Cemeteries. 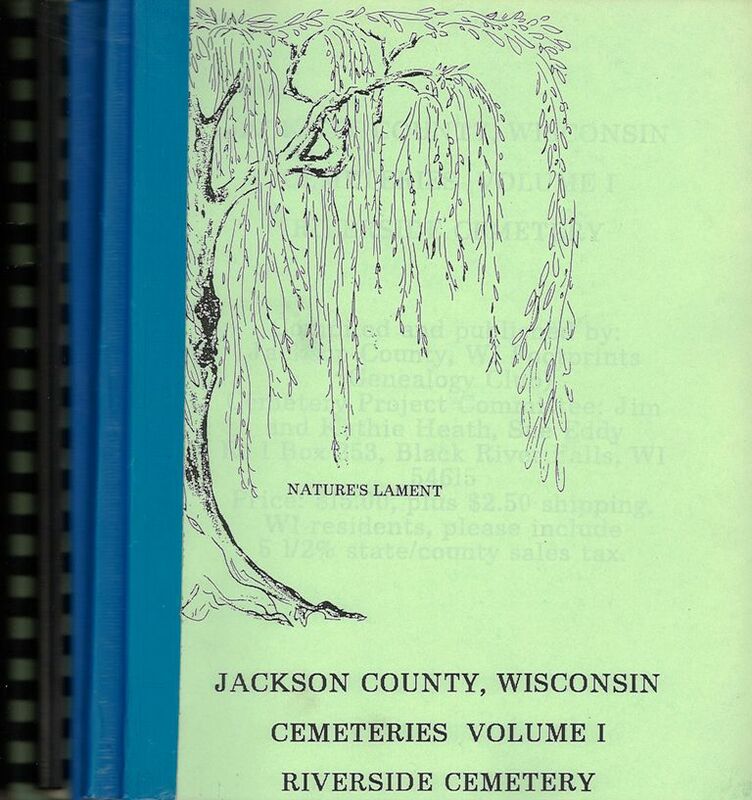 Also includes maps, photos, and information about each cemetery. 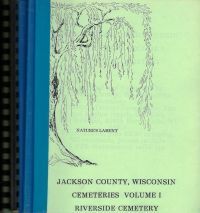 Compiled and published by the Jackson County, WI Footprints. Soft cover; good condition. 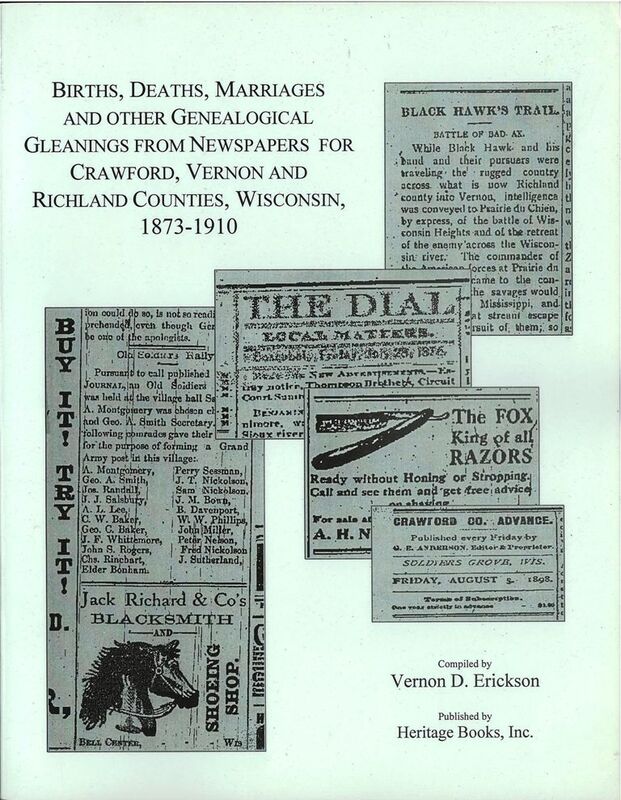 Alphabetical surname index of births, deaths, marriages, and other genealogical gleanings from Crawford, Vernon and Richland County, Wisconsin newspapers, 1873-1910. Compiled by Vernon D. Erickson in 1997. Soft cover; 350 pages. Excellent condition.